Just finished – well I have to hand stitch down the hidden binding (I’ll do that this evening) – but otherwise it’s done. This is based on a photo of two boys watching some men working that I took in Minerve (in the south of France in the vicinity of Limoux) in 2010. I enlarged the photo a bit, enlarged the boys a bit more, printed the resultant image on fabric, cut out the boys carefully and some of the rocks of the roadway, then used fused appliqué to build up the rest of the image. Carefully edged stitched all the bits of fabric, then thread painted the rest. I also darkened the grey fabric of the roadway using some fabric pastels to blend the colour better with the paving rocks. I wasn’t sure the piece was going to turn out but I’m happy with the outcome. Trying to find a fabric to “frame” it took a bit of looking around. In the end I found this half yard in my stash of batik fabrics – I chose it because the green/grey blended with the roadway, and the hint of pink makes the boy’s shirt stand out. The blue embroidered signature does the same for the smaller boy’s jacket. 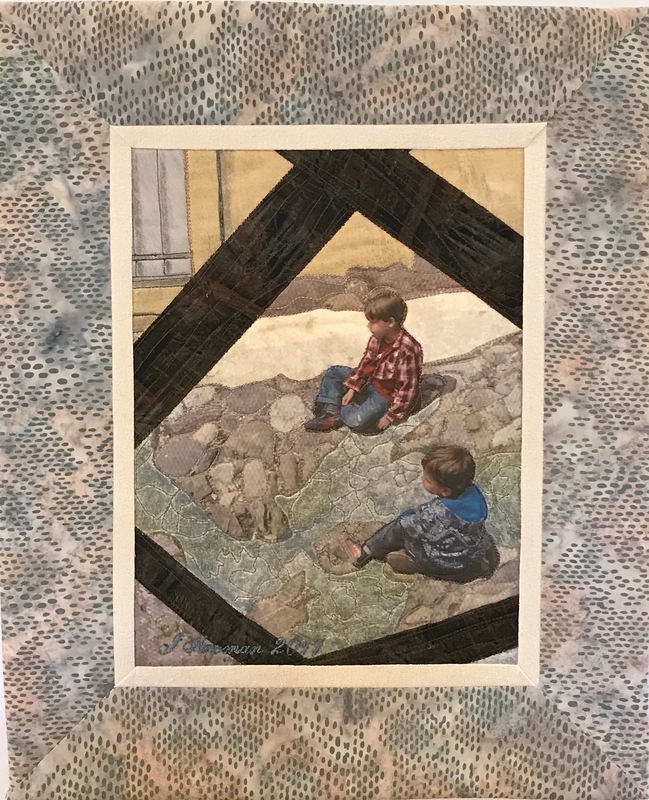 I captured the image through a lattice on the porch of a nearby house – the heavy brown bars – I thought about leaving them out but they frame the boys and draw your attention to them. So another piece finished for the exhibition in Parrsboro at the end of August. I had to take a break from hand stitching the hidden binding on the back. I’ve got it half done, I’ll finish the task later this evening. (My hand stitching isn’t fully back to where it was before my thumb decided to stop working, but I can control the needle much better than I could before the carpel tunnel surgery!). 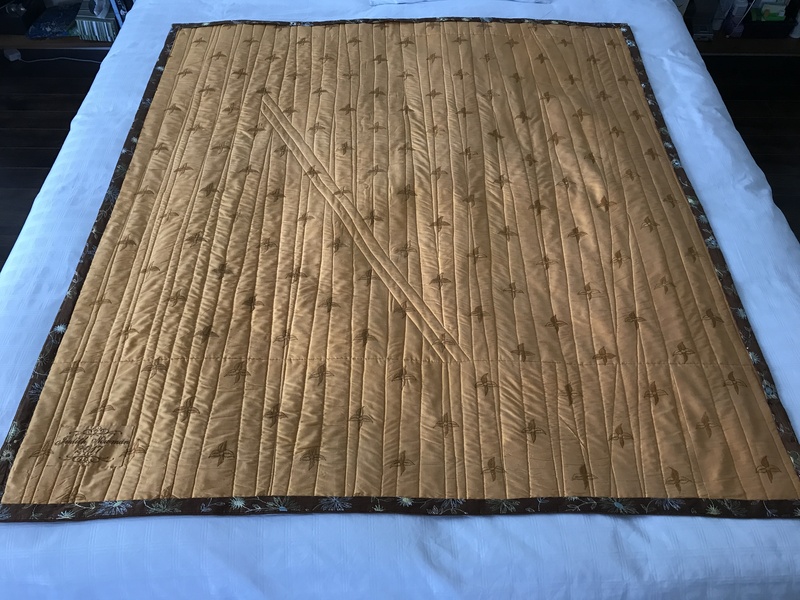 I had intended doing a pillowcase backing but the backing silk fabric just would not stay flat and in place, so in the end I began the quilting starting in the centre and worked outward toward the sides, doing my best to keep the silk backing from sliding around. I tried pinning the quilt sandwich but couldn’t get the backing layer to lay flat so in the end I removed all the safety pins, just pinned the top and one side edge and then did my best to keep smoothing the backing as I stitched each quilting seam. A much more difficult task than I had expected. To get the unbound look I was after on the finished quilt, I did a hidden binding using some bronze embroidered silk fabric that came with the other two pieces, so it matched. I considered machine stitching the binding in place, but I like this unbound look with the quilting stitching coming to the very edges. When the quilting was finished the back wasn’t too bad, Still a bit of fullness in spots, but when steam pressed again it will be reasonably flat. And I like the embroidery in the fabric – it provides a bit of visual interest. Just two sides left to hand stitch – the label is already sewn in place. The finished quilt is smallish when compared to most of my other quilts – similar width but shorter (my lap quilts are usually about 5 1/2′ long – this quilt is 55″). It’s still long enough to cover a person (maybe a shortish one), but it would make a nice hanging for a hallway, or bedroom. These, too, are just finished. 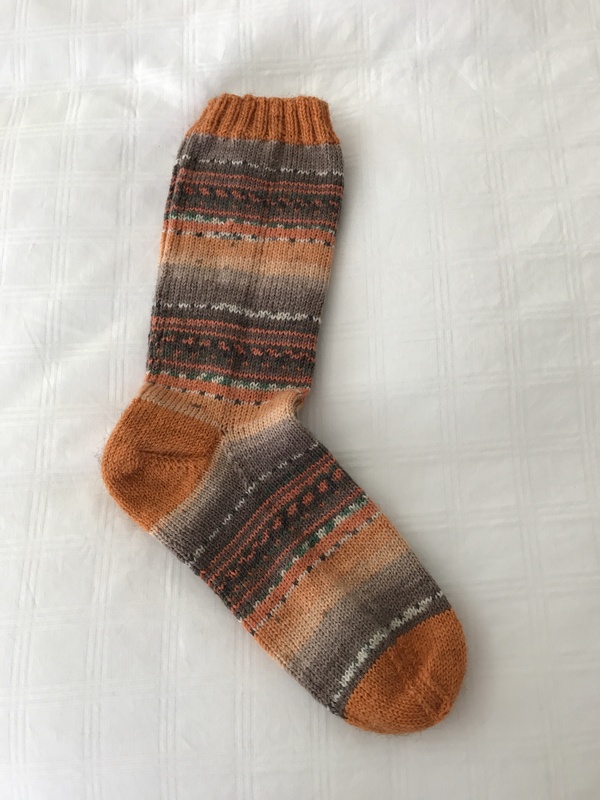 They were a delight to work on – the pattern as it emerged was interesting and kept my interest, even on the second sock which I usually find boring to knit. Also it was easy to find the repeat to start the second sock. Once finished on to another pair. Here’s the yarn I’ve started using. 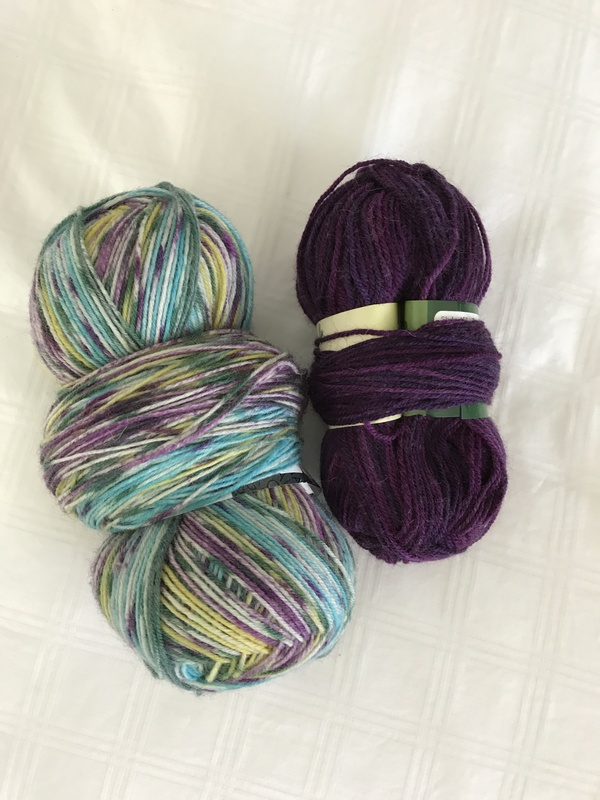 The purple for cuff, heel, toe and I’ll be interested to see what pattern appears from the variegated yarn. Many years ago, I was looking after the UNICEF booth at one of our local Christmas Craft Fairs. Across from me was a quilter with a gorgeous silk quilt for sale. She’d collected silk ties and had cut bowtie shapes from the silk she salvaged. 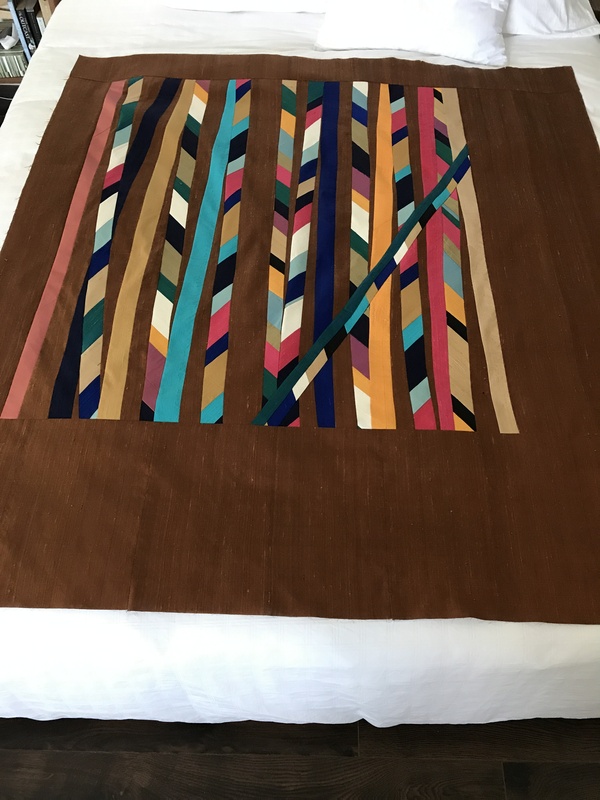 I loved it and wished I could have afforded it – but it was too large to be wall hanging and too delicate to use regularly on a bed. I admired it every day I sat there selling greeting cards. I never forgot it and when a friend gave me a bundle of silk fabric she’d purchased in Singapore and which she had decided she’d never use, I thought, a silk quilt. I decided the bronze silk dupioni would make a lovely quilt background. I ordered a dozen silk fat quarters from Etsy a couple of years ago in colours to complement the bronze. 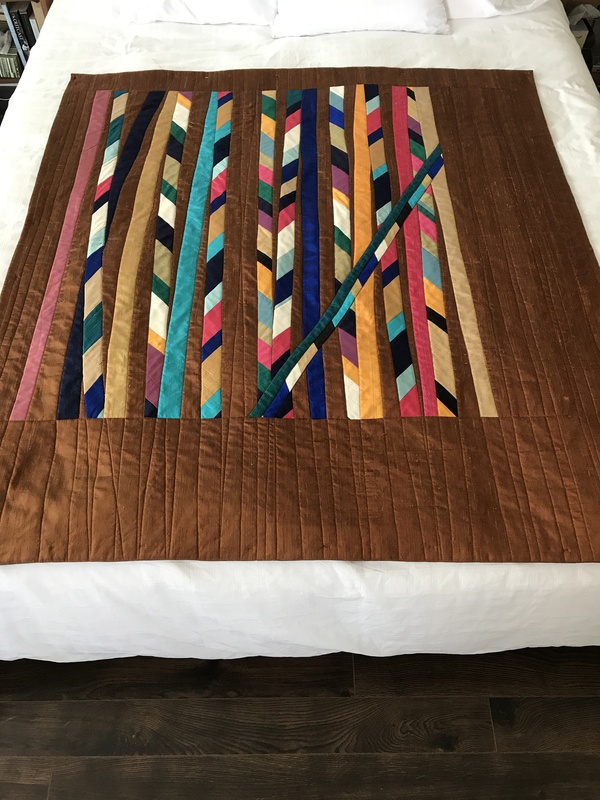 I wanted to do something modern and decided to mix some small piecing of the coloured silks to form strips on the diagonal and solid strips. Finally finished piecing the top this afternoon. The central panel is offset to the top and left. The finished quilt size: 51″ x 56″. I had wanted to make it more rectangular but I just didn’t have enough bronze silk. I have a few small scraps but in order to keep the grain of the silk running top to bottom I had to piece the top and bottom strips so my size was limited by the amount of silk I could cobble together. Tomorrow I’ll set up the quilt sandwich. I’m using a second of the pieces of silk fabric. I have enough for the backing, but I will have to piece it horizontally because it isn’t wide enough to do a single running length and I haven’t enough silk left to create a pieced strip. Besides the embroidery in the golden silk is enough detail and I will be careful to cut it between the embroidery designs so the seam, when pressed open, will be relatively unseen. I really see this as a largish wall hanging rather than a lap quilt. 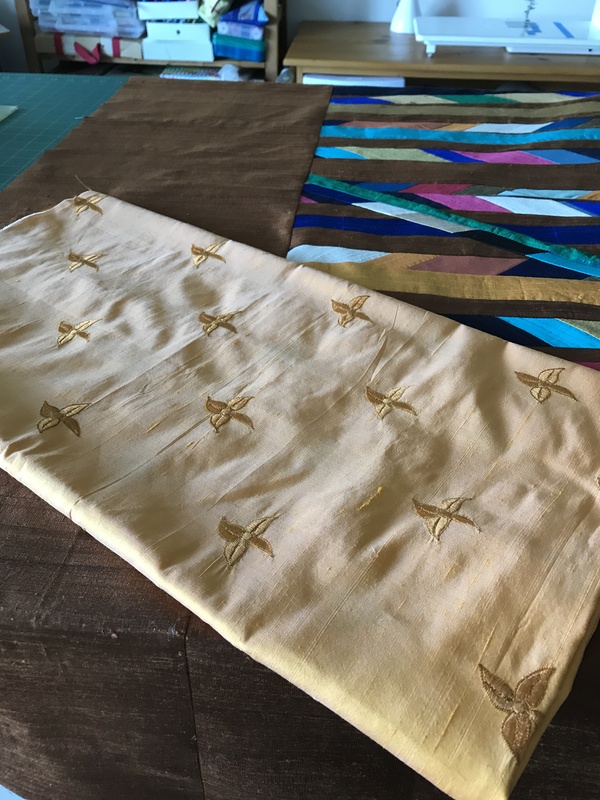 If I’d had enough bronze silk, I’d have finished the quilt with a narrow binding, but because I don’t I’m going to finish the quilt using a “pillowcase” turn. I plan on quilting it stitching in the ditch from top to bottom and adding some more vertical lines where necessary in the border areas. Wimbledon has taken over my life for the past ten days! I don’t watch all the tennis matches but I am interested in a lot of them. So my time has disappeared and I haven’t accomplished much except some sock knitting while I’m watching. The pair I’m working on has another two evenings of work left in them and then I’ll photograph them and post the image. 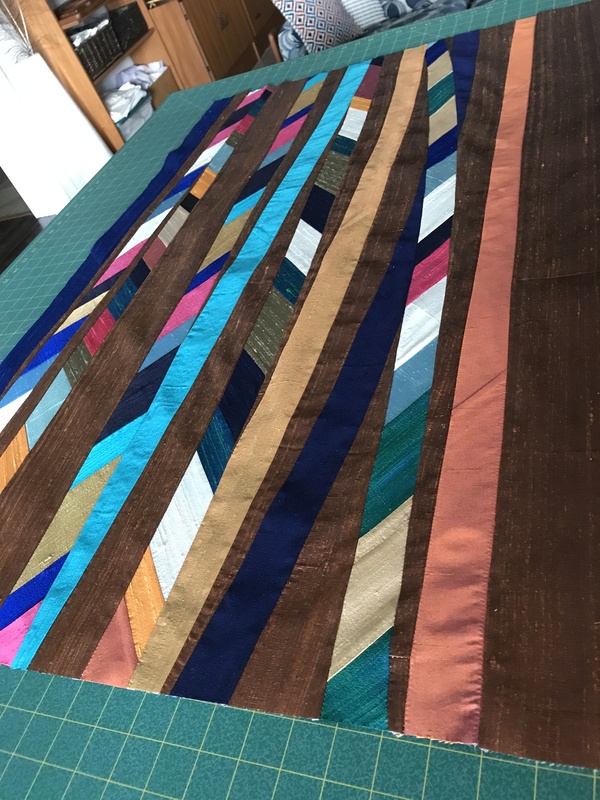 As far as quilting goes – I’ve started working on the silk quilt – It will consist of an offset inner panel constructed from solid strips interspersed with pieced strips (with the piecing seams going in opposite directions creating a sort of chevron effect). Before beginning, I backed all of the silk dupioni fabric with “Sewer’s Dream” (a high quality sheer, fusible, washable, polyester interfacing) – to stabilize the silk which otherwise frays dreadfully. I have enough strips, both solid and pieced, assembled – but I’m only about 1/3 of the way through assembling that inner panel. Surrounding that panel will be solid strips of the bronze background silk. I don’t know why, but I’m having difficulty making much headway with this quilt. Tomorrow it’s the women playing at Wimbledon (I prefer watching the men play) so I should be able to get back to work on it. Yesterday, I took a day off completely to visit with two friends who are attending the Scout Canada Jamboree being held in Nova Scotia this year. I drove out to the site to pick them up early in the morning, brought them back to my place so they could shower and do laundry. Then we went out for lunch, did a bit of shopping, returned to my apartment to relax, have tea, and a light supper before I drove them back to the campsite for the remaining three days of camping. Brave women, let me tell you – aside from the 5,000 youth (and 1000 adults) at CJ’17, there is mud, and long hikes to tents, meals and toilets, and ticks. They smuggled me into the camp to have a cursory look around – I was happy to get back home. I’m too old for that sort of outdoor experience although the youth and adults all looked to be having a wonderful time. My connection to Scouts Canada is that for the past five or more years I’ve been involved in the program development that’s been underway – these two women and I were the driving force behind the preparation of the Scouter Manual. Now that program implementation is in full swing, I’m just on the sidelines watching how the rollout is progressing. Hence my interest in visiting the camp. Andrea, one of the women, was wearing her outdoor hat day before yesterday when a scout commented on the “face” on the side of her hat! Needless to say, I got a photo – here it is! 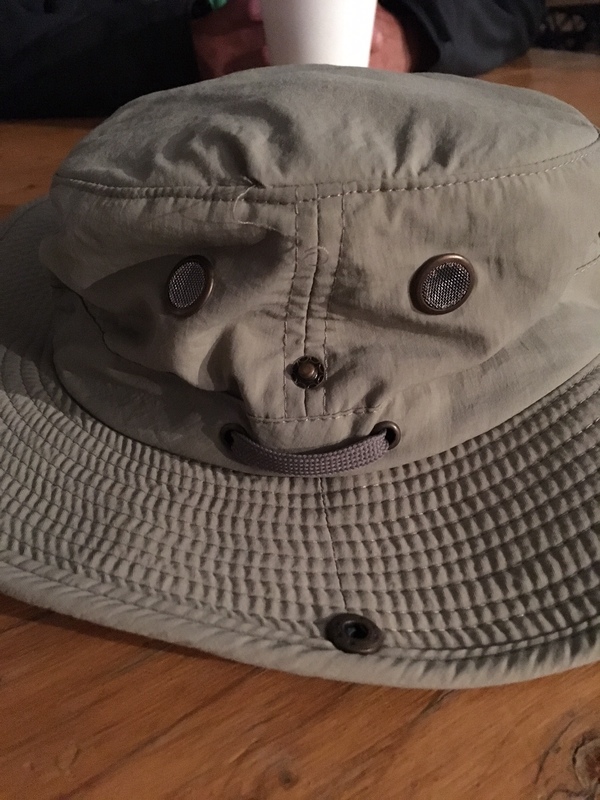 A nice clear “face” it is. So socks, and quilt – I’ll keep working at both and share photos when I have something to share. Men’s semifinals are on Friday, final on Sunday. Then about a month until the US Open and two weeks of disruption, again.